Are you finished with your acute rehab and looking for outpatient options for your therapies? Have you been told that you have met the maximum potential that your outpatient therapists can achieve with you but you know you want and need more therapy? Have you been sent home with a home exercise program that you and your family/caregiver are having trouble doing? 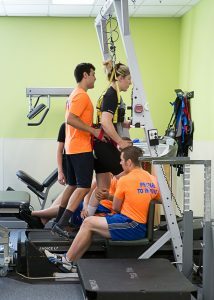 Do you wish you still had access to the awesome equipment in rehab? Are you feeling like you, or your loved one is ready to get out and get moving because sitting all day in a chair is causing many other health problems, fatigue, muscle deterioration, pain, and risk of skin injury? ExercisABILITIES is designed to help you with all of these and more! 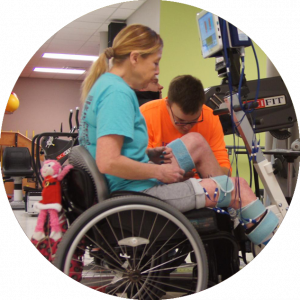 ExercisABILITIES provides a continuum of care for individuals of all ages children through adults living with paralysis due to spinal cord injury or other neurologic injuries from both congenital or acute injury causes. Our facility is 100% accessible, has much of the same equipment as you encountered on rehab, and has specialy trained staff who understand your needs and are able to assist you in getting back your health while continuing your rehabilitation process. We have PT, OT and SLP on staff and will work with you depending on your qualifications for skilled therapy within insurance rules. PT cannot be used to provide Intensive Locomotor Training, Overground, long term FES, or guided training due to insurance regulations and skilled PT norms. Activity-based exercise programs are designed specifically for clients with physical disabilities to enable them to be “fit for life.” Our personal trainers and exercise physiologists have received specialized Neuro Recovery Network (NRN) training. Research conducted by the NRN has shown that activity based exercise brings significant improvements in people with paralysis in many areas of function. Improved trunk strength, improved bowel and bladder, improved circulation, improved health measures, decreased spasticity and overall improved muscle tone and well-being have all been shown in multiple large scale studies. It is important to continue your rehabilitation long beyond the point where insurances cover physical therapy. 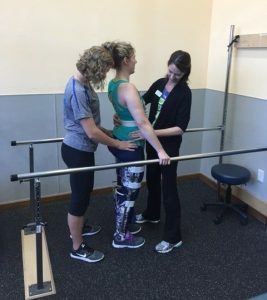 Your PT will end too soon, and if you do not continue your rehabilitation in a safe, effective setting, you will likely lose your gains and begin to see side effects of immobility including increased weight, decrease muscle tone, risk of skin breakdown, contractures of your joints, and much more. An intensive program will keep you strong and you will see further gains well beyond the end of traditional therapy. We see improvements in many areas 3, 5 or even 10 years after injury. It is never too late to start. You can start at any point. Is ExercisAbilities like Project Walk or NRN Model Center? ExercisAbilities is independent. We are not affiliated with Project Walk or the NRN. We are also not affiliated with the Mayo Clinic. However, our PT and our activity based trainers were trained by the NRN and have previous work experience that includes the Mayo Clinic. Our equipment, services, and skills are similar to NRN model centers and include Locomotor training, FES (Functional Electric Stimulation) Bike/RT 300, ICare Power Elliptical, overground training, vibration therapy, and much more. Sounds expensive. How do I pay for this? We accept most major insurances to cover the cost of medically skilled and necessary physical, occupational, and speech therapy. Our office can work with you to assess your insurance coverage. Once you no longer qualify for skilled progressive therapy, you should transition to a activity-based exercise and fitness program. In the US, exercise is not covered by insurance since it is considered experimental and beyond the usual and customary medically necessary insurance model. However, Exercisabilties is a nonprofit and our goal is to assure that every person who needs a service in order to achieve their health and rehab goals can access it. Our business office staff will work with you to fully understand the cost of our program and will explore alternative funding. You may find grants or fundraising is a great source to pay for the program. ExercisABILITIES is also a 245D MN home and community based services provider. We can explore options for you to use your waiver to meet goals and improve your health and quality of life. ABILITY Program Fees: Evidence based research finds that optimal outcomes occur with 3 hours per day at a minimum of 3 days per week. Current ABILITY Paralysis Recovery Program is $100/hour or $300/day. This includes all modalities. To participate in the neurologic recovery programs, contact us for your Free Fitness Assessment today! Get an MD order for physical therapy, occupational, or speech evaluate and treat. There is no referral required to start directly in our ABILITY activity based training program without PT. You are one step closer to an improved and healthier you! Call us today and we are happy to answer any questions!